Labor versus Business: From Economic Wars to Culture Wars? N ew Orleans I wonder with the diminishing strength of unions whether we are about to finally move from front page economic wars to the back page culture wars so much enjoyed by the right. Not able to fully move women back to the kitchen or African-Americans back to the plantation, perhaps they feel they will now have more success eliminating the history of workers altogether. A couple of things brought this to mind. Early this morning setting up Citizen Wealth and Social Policy at a conference being held by the Association of Labor Educators, I listened to a fellow from Stoneybrook complaining to a colleague about how union leaders themselves never referred to their members any more as workers or a part of the working class, but instead talked endlessly of losing “middle-class jobs,” assaults on the “middle class,” and so forth. Governor Scott Walker of Wisconsin seemed to make sure he was always a long way out of camera shot from the statue honoring populist politician and labor backer, Robert Follette, the legendary Wisconsin freedom fighter, during the recent evisceration of public workers rights in that state, where those same rights had been pioneered. 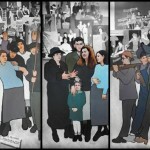 Now it seems there was a big controversy in Maine over a 36-foot mural in the state Department of Labor building there which depicted loggers, shoemakers, shipyard workers, and others, but also had a panel on the big Jay, Maine paper strike among other things. The Governor Paul LePage, another newly elected Republican, has ordered it removed according to one of the last labor reporters on the newspaper beat, Steven Greenhouse. He thought it offended some business folks, even though it has been up for 3 years with no real problems. These are more than just canaries in the mine shaft. The history of workers and the working class in America (and elsewhere!) has always been a behind-the-doors, back-of-the-house specialty. Hearing how attendance has dropped among the labor educators as university programs have been pared down, unions forced to eliminate education programs, and states from California to wherever in bitter political purges of funding for such work, it is clearly a situation where there’s going to be even less and less that gets out there. The chance that what emerges will find its way into the hands of workers themselves is even more unlikely. The signals are clear that the right wants to bleach out the last of the blue collar as they glorify greed, bankers, and high-tech, even while we bailout them out and their secretaries print out their e-mails for them. It feels like now that they see blood in the water and feel the whip in their hand, that the effort to make workers invisible and erase what remains of their work, honor, and tradition in our culture will build up force to try to sweep everything in the way of its rage. No longer able to command the front page with news of strikes or settlements, it appears now we will find our place in the Arts section as more obituaries are written to mark the passing of our times. We better stop it now, while we still can!